To compete in the global market, North American mold makers must actively hunt down and eliminate process and operational inefficiencies wherever possible. 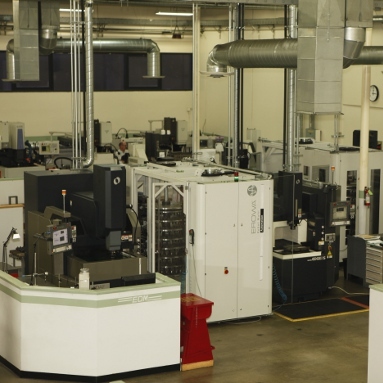 Fairway Injection Molding Systems, located in Walnut, Calif., maintains a vigilant search for improvement of its manufacturing processes in order to remain at the forefront of the mold manufacturing market. Serving a wide variety of markets from around the world, Fairway builds high-cavitation molds for medical devices, personal hygiene and consumer products, and works closely with its customers from design through implementation in order to deliver the best possible molding system solutions. Fairway manages its own business with this same attitude of doing things right, always evaluating the overall impact of work processes, technology and investments. New ownership in 2006 instituted the philosophy of “if there’s a better way to do something that improves results for customers, it’s on the table.” That’s not to suggest that Fairway jumps at every hot, new trend to hit the industry. But when management’s internal research, comparisons and testing prove out a technology as a true productivity or quality enhancement, Fairway is willing to invest. With almost every project moving through the shop landing in Fairway’s sinker EDM and vertical milling machines, revitalizing and upgrading these capabilities were natural first steps for continued growth. “While we no longer use the EDNC32 to produce modern tools, it has been reliably burning metal for us every day for nearly 30 years. It’s this type of value that changes the ROI equation and enables companies like us to succeed,” said Schissel. 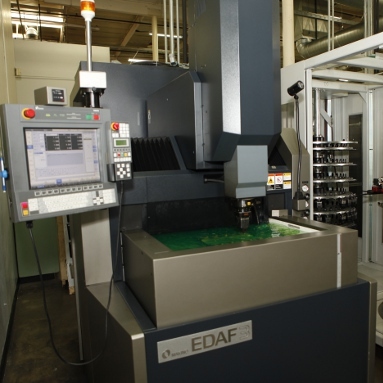 EDAF – The addition of SuperSpark technology with the EDAF machines has provided Fairway with a 20 to 30 percent reduction in machining time over standard sinker EDM technologies. The first clear opportunity for improvement that Fairway management observed was in the replacement of its outdated manual machines. While these machines performed admirably for years, the company understood that this level of technology wasn’t enough to become a globally recognized mold-making operation. While increasing throughput was Fairway’s primary objective in expanding its capabilities, accuracy also remained a critical concern. With this in mind, Fairway management tasked Bill Black, EDM team leader, and Jim Gabel, CNC milling team leader, with researching high-performance EDM and milling machines to replace the company’s outdated equipment in order to meet production goals. Each EDM cell has been configured to feed 248 electrodes and four work pallets that hold eight or more workpieces in a single pallet load. 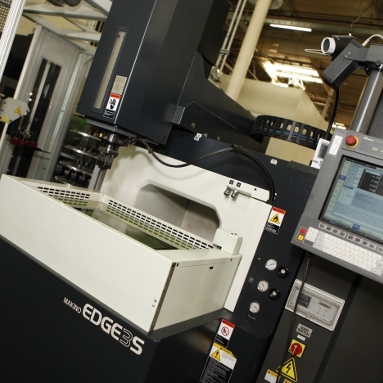 Fairway’s initial investments in automated EDM capabilities began in 2006 with a robot automated cell featuring Makino EDGE2S and EDGE3S sinker EDMs. As when developing solutions for its customers, Fairway’s sinker EDM strategy has been driven by process requirements, capabilities and technology, even if this plan required rearranging functional cells and reworking infrastructure. Fairway’s first automated sinker EDM cell featuring the Makino EDGE2S and EDGE3S machines was installed in 2006. An EROWA robot, which managed distribution of both electrodes and work pallets, tended both machines. With constructive cooperation among Fairway, EROWA and Makino, installation of the cell was completed in a smooth and efficient manner. The robot was configured to feed the EDM machines with 248 electrodes and four work pallets. Fairway typically mounts as many workpieces as possible on each pallet, enabling production of eight or more completed workpieces in a single pallet load. Efficient and reliable pallet transfers are facilitated by the drop-tank design of the sinker EDM machines, letting the robot easily reach into the work tank. This setup meant that with electrodes prepared and work pallets loaded during normal business hours, machining processes could continue unattended overnights and weekends with only a brief visit to the shop by an operator to set up new work pallets. With its V22 and S33 investments, Fairway is consistently holding tolerances of plus or minus 0.0001 inches and 30 percent average cycle time reductions in both hard and soft milling. Fairway’s automated EDM capabilities have enabled machine uptime to reach as high as 99 percent in long-cycle time applications, and an on-time delivery rate of 90 percent. 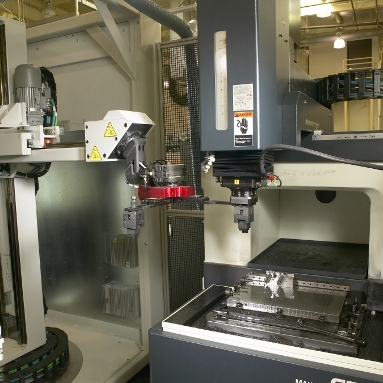 In 2012, Fairway consulted Makino on a second set of investments that would expand on its milling and EDM capabilities. To grow its overall milling capacity and workflow flexibility, the company decided to add a second V22 to its milling department. 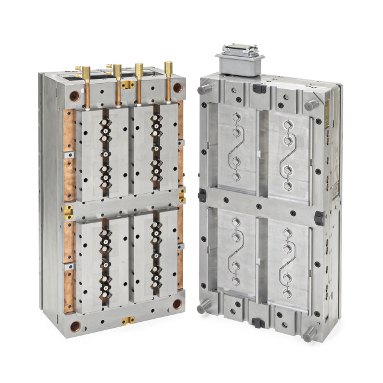 The hard-milling accuracy and productivity of the machine would enable Fairway to replace EDM operations in many features of its mold inserts, especially where there are no requirements for an EDM finish. In addition, the company planned to incorporate hard-milling considerations into its mold designs to remove features that would typically require EDM processing. Despite these efforts to reduce EDM operations, Fairway recognized the need for additional EDM capacity in applications featuring complex feature geometries that cannot be milled. The company set out to build upon its previous cell investments with additional machines, configured in a way that connected EDMs would face in the same direction for optimal access and productivity. However, in order to accomplish this goal, the sinker EDM on the left side would require an alteration that would move the position of the control panel to the opposite side of the machine. Fairway dismantled its existing automated cell to separate the two existing right-hand control machines to be used on the right side of each new cell. They then paired each of the existing machines with a robot and one of the new EDAF3 left-hand-control machines. While this approach took extra time and effort, it provided an optimal arrangement with all of the machines facing forward. This new arrangement decreased the total floor space required for the cell while also minimizing the time it took operators to work within the cell. As a side benefit, all tool and workpiece changes in the carousel are handled from the non-working side of the cell, keeping the work area clear. 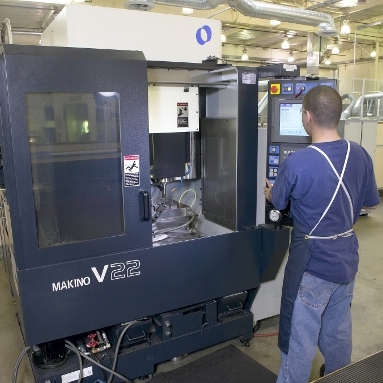 The V22 has allowed the company to incorporate hard-milling considerations into its mold designs, removing features that would typically require EDM processing. In addition to the raw productivity and throughput that the new EDM cell afforded Fairway, an additional feature of the Makino EDAF3 EDMs truly changed how Fairway produced finished molds—SuperSpark. The SuperSpark technology built into Fairway’s EDAF3 machines uses a combination of shortened jump cycles and spark-gap adaptive power control to improve cutting efficiency and productivity. More than 60 percent of the total process time is spent out of the cut in standard sinker EDM jump cycles. According to Makino, SuperSpark cuts the jump time by more than half due to the shortened jump height, requiring less time for electrodes to return to the workpiece. This saving of time lets Fairway accomplish more at faster rates than ever on these two machines, further leveraging the maximized utilization rates provided through automation. Further improvements to machining efficiency are afforded by the machines’ spark-gap adaptive power control, which enables electrodes to discharge sparks during the jump cycle for continuous cutting. As the electrode depth increases, the power and spark gap decreases to prevent overburn. Together, these technologies improve total machining times by 20 to 30 percent over standard sinker EDM technologies. Prior to the installation of the EDAF3 machines, Fairway was struggling to burn a 0.013-inch subgate with a copper-impregnated graphite electrode on a 64-cavity mold that had proven impossible on any of its existing machines without significant pitting and electrode wear. “Makino’s SuperSpark technology took us from a position of not being able to deliver to being done in a matter of hours,” added Cockrell. Overall, what these investments have taught Fairway is to look at manufacturing differently. This outlook extends far beyond changing the part design or altering programming methods, but what it also means is that Fairway can rethink its entire business process and strategy. Based on the accuracy and precision afforded by the new mills and EDM cells, Fairway has seen a virtual elimination of hand-fitting, something that was once a significant requirement for finished parts, and a significant reduction in polishing requirements. “The surface-finish capabilities and repeatability take a lot of the stress out,” according to Black. “The Makinos always hit the numbers. There’s no need to second-guess or adjust,” says Cockrell. Similarly, electrode wear, a critical factor in any sinker EDM process, has also been an area of significant improvement for Fairway. While those are bottom-line benefits of these investments, the greatest impact on Fairway’s business is the repeatable .0002 inches precision delivered around the clock, 24/7. True “lights out” operation has been a game-changer for Fairway, enabling the company to dramatically increase throughput without requiring additional labor resources. Indeed, the process improvement and optimization efforts at Fairway are ongoing. Always looking to identify and remove the next business constraint, Fairway is exploring other potential additions to the shop to keep up with the performance of its Makino sinker EDMs and verticals. “5-axis is next for us,” said Cockrell. As a growing company, winning business globally and poised at the top of the mold-making industry, the path forward looks very bright indeed and Makino is ready at every turn. © 2019 Makino. All Rights Reserved. Competitive Mold Maker is the only publication that serves the die and mold making industry exclusively. It is available in print as well as online. Click here to subscribe.